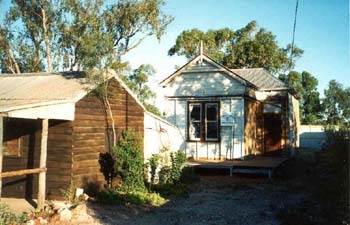 Occupied for forty years by Sid and George Graham, who extended their endless "verandah hospitality", the hut was built in 1932 by Albert Spicer when he struck opal. His son Mal still visits the Ridge and has presented the Society with original photos of his father and their camp at the 3 Mile. Known today as Heritage Cottage, the hut offers tourist information and select handcrafted items are for sale in an historical setting. The bark dividing walls, dirt floors and kerosene tin chimney are typical of early Ridge architecture. The original wood stove may belt out heat, sending up whiffs of smoke, on a cold winter's morn! 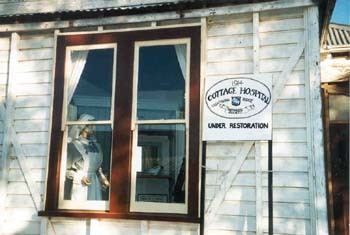 In the backyard of the Reserve is the relocated Cottage Hospital, presently under restoration. 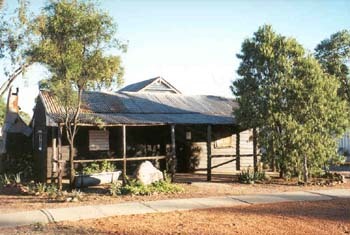 This modest 3 room Federation structure was built after Lightning Ridge opened the eleventh Bush Nurse Association in NSW, October 1914. This rural health program was patterned after one Lady Dudley, wife of the Governor General of the day, had established in Ireland, and was supported mainly by community funding. 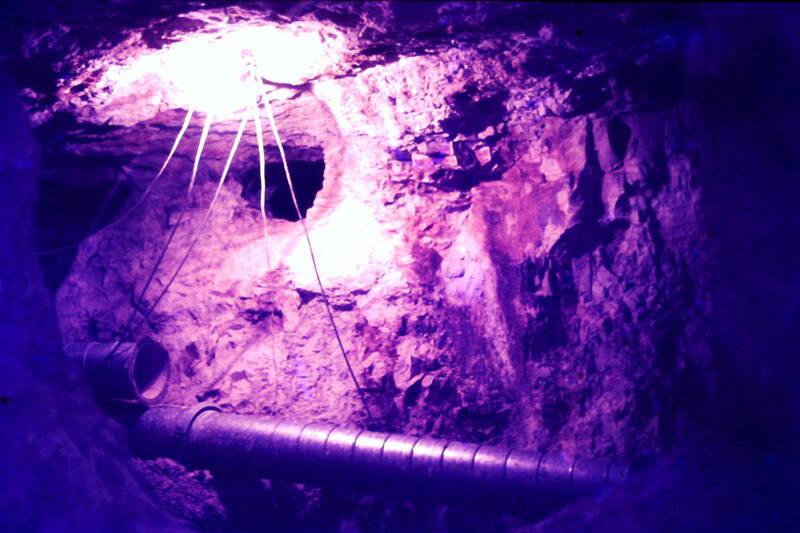 The BNA at Lightning Ridge was the longest serving in NSW, and the only one still able to support two nurses, when the scheme was absorbed by the Health Commission January 1, 1975. . Built of locally available cypress pine (white ant resistant), the Cottage Hospital is of a reverse construction (framework on the outside for economy). It was erected by volunteers at no cost, according to the Walgett Spectator, presumably under the direction of Tom Urwin and Ronald McDonald, local builders of the day. The BNA is the only example of this style of architecture in the town, and must have been rather grand amongst the bark and tin huts!